Our culture hero is not the artist or reformer, not the saint or scientist, but the entrepreneur...The characteristic art form of our age may be the business plan. Over the past few months our conversations with designers have brought many themes to light, but one of the obvious conclusions is just how nice and generous the design community is. For that, we’re thankful. We’ve also done a lot of reading. We devour anything we can get our hands on relevant to the intersection of design, entrepreneurship, and culture. Thanks to the great folks at Instapaper, we can easily come back to these articles. Today we return to “Generation Sell,” an article by William Deresiewicz that appeared in the NY Times in November. Deresiewicz calls this generation, one that we (both born in the mid-80s) are a part of: Generation Sell. “We’re all in show biz now,” he says. “Walking on eggshells, relentlessly tending our customer base. 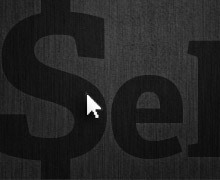 We’re all selling something today, because even if we aren’t literally selling something (though thanks to the internet as well as the entrepreneurial ideal, more and more of us are,) we’re always selling ourselves.” He argues that we are all nice because we are all salesman of ourselves. Every young person wants to start a business, and stay positive in an effort to retain their spotless personal brand. Deresiewicz may argue that the design community has been so nice to us because they want to sell their brands—and we’re sure that’s some of it—but we are more idealistic. We believe it’s more honest than that. The internet reinforces our interconnectedness: we can band together to fight SOPA, access mentors with a click of the send button, and contribute to design dialogues in places we’ve never been. Design, perhaps more so then other industries, understands the possibilities of collaboration and optimism—and we feel honored to play our tiny role. Kern and Burn celebrates designers who have opinions and are willing to share them, designers who are concerned with more than just their personal brand. We’d love to hear your thoughts on a few questions that come to mind: Are we more than just salesmen of ourselves? Could the entrepreneurial lens be a framework that allows us to support each other, instead of big corporations? How do we present ourselves authentically in the age of the Twitter handle? We’re planning on adding comments to our site, but in the meantime, feel free to send thoughts to hello@kernandburn.com. If we think they’ll provide value to Kern and Burn readers, we’ll post some responses in the future. We recommend reading the full “Generation Sell” article in the NY Times.